We’ve mapped the real minimum hourly wage needed to be able to get a one-bed rental in all 120 London postcodes. 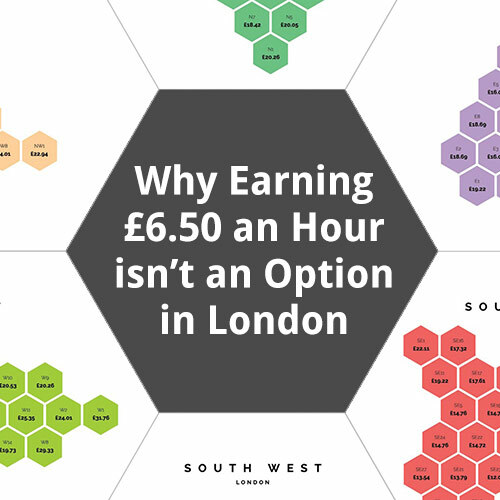 The results are sobering – there is only one postcode where a minimum wage earner, working full time on £6.50 an hour, can afford a place of their own: Abbey Wood, a South East London suburb in Zone 4. The graphic above shows the lowest hourly wage that an individual must earn (working 37.5 hours a week) to cover the cost of a one-bedroom rental in each postcode area, without spending more than 50% of their income. While the Mayor’s definition of ‘affordable’ is spending 35% of your income on rent, for many Londoners it’s far from reality. But what about the London Living Wage? At £9.15 an hour, it means you can add just one more postcode out of the 120 to your housing search: Enfield in Zone 6. With about 700,000 people in the capital earning less than the Living Wage, that’s a lot of people chasing a shrinking number of cheap properties. Plus, the Government’s minimum wage increase of 3% is one-half of that of the rise in rental prices, which is forecast to continue growing steadily at a rate of 6% every year. As the gap between the wages people earn and the price of decent housing widens, the problem will continue to be compounded. Rental costs have grown significantly in recent years due to a number of factors, the main reasons being supply failing to keep pace with demand, stagnant wages and rising house prices. This research shines a light on the scale of the housing crisis in London and how the increased minimum wage and even the London Living Wage is no longer sufficient to live on in the capital.